The Dolphins have a hole to fill at the Tight end position. Is the team looking to fill that hole with a top draft prospect? The Dolphins have needs all over their roster that require addressing. The linebacker unit is a mess, the guard position could use some serious help, and the running back stable is in need of depth. In addition, Miami’s tight end group is expected to receive a makeover with the release of free agent bust Julius Thomas, not to mention the fact that all-star blocker Anthony Fasano is a free agent and could choose to retire once the new league year begins. According to the Palm Beach Post, it looks as though Miami is looking to address the situation in the tight end room through the draft, or at the least, the team is doing its due diligence. 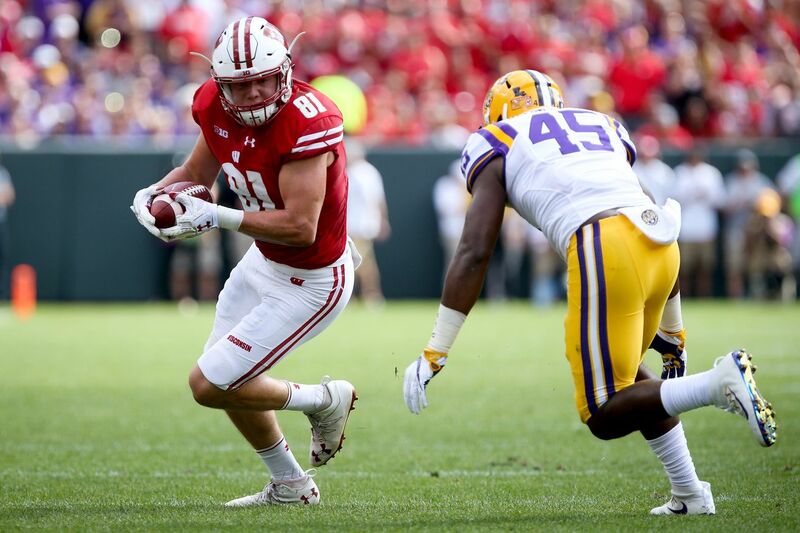 According to Jason Lieser, the Dolphins front office and coaching staff met former Wisconsin Badger Troy Fumagalli end during last month’s Senior Bowl. The 6’5” 247 lb towering tight end was an integral piece of the Wisconsin offense that took down the Miami Hurricanes in the Orange Bowl. Despite having just nine fingers after having one amputated at birth, Fumagalli has a propensity for catching absolutely everything thrown his way. Not to mention the fact that the top draft prospect is a solid blocker as well. The Dolphins have yet to find a solution to their tight end conundrum since letting Charles Clay go in free agency almost three years ago. Fumagalli seems like the type of player who can provide that safety valve for Ryan Tannehill or whoever else is leading Miami’s offense for the foreseeable future. Over his last two seasons at the collegiate level, Fumagalli caught 97 balls for 1,127 yards and six touchdowns, and scouts at the NFL level believe he can surpass those numbers in the right offense. If the Dolphins address their needs on defense or along the offensive line earlier in the Draft, it is a distinct possibility that general manager Chris Grier and Co. could choose to add a talented tight end like Fumagalli in the middle rounds. As of now, Fumagalli is receiving a third round grade from most Draft experts.